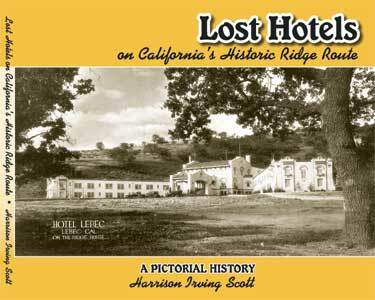 " Lost Hotels on California's Historic Ridge Route "
This is a paperback "Coffee Table" book having 120 pages with 100 pictures. Some of the pictures have never been published before. 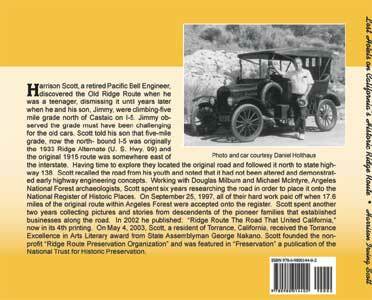 The book covers Hotel Lebec, the Gorman Hotel, Sandberg's Summit Hotel, the National Forest Inn, the Tumble Inn and the French Village in Newhall. The French Village although not on the Ridge Route was constructed by the family that built the National Forest Inn and the Tumble Inn. In addition to the pictures, a brief synopsis is given regarding the history of each site. From Los Angeles area, go north on I-5 freeway taking the PARKER RD. exit at CASTAIC. At top of off ramp turn right onto the RIDGE ROUTE. After traveling through town on the maintained portion of the road you reach TEMPLIN HWY. Disregard "Not A Through Road" sign. Your trip ends at Hwy 138 near Gorman. Return to Los Angeles by turning left at Hwy 138, you will soon junction with the I-5 FWY. From Bakersfield area, take I-5 south. Exit at Hwy 138 heading toward Lancaster. After passing Quail Lake watch for the "Old Ridge Route" sign and turn right onto the 1915 Ridge Route. You climb up hill past PINE CANYON intersection to the unmaintained portion of road. Your trip ends in Castaic or you can elect to turn right at Templin HWY to access the I-5 FWY. CAUTION, The trip is approximately 20 miles. there are NO RESTROOMS or SERVICES. Take WATER. Although the road is only maintained as a fire road it is passable. Drive slowly and enjoy the stupendous views. For a guided tour, please see TOUR INFO.